Vivid Motion Inc is 501-c(3) non-profit dance company in Portland, Maine. 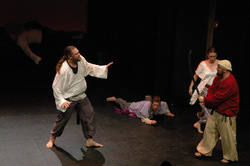 In 2003, local dancers decided they wanted to perform. There wasn't a place for dancers who could only dance part time. Vivid Motion was formed, and now 10 years later they're still going strong. We make dance fun to watch as well as to do. We are...Portland's Innovative and Kinda Quirky Dance Company!